Greg serves as lead custodian and has been on the First O’Fallon staff since 2008. He takes care of daily upkeep of facilities and sets up for the many activities on campus. Greg and his wife Christie have been members of First O’Fallon for 26 years. They have 2 daughters, Rachel and Jenna. 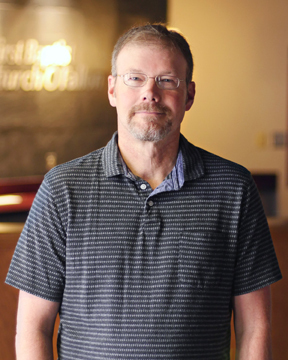 Greg’s favorite verse is Proverbs 27:12, “The prudent see danger and take refuge, but the simple keep going and pay the penalty.” Fishing is Greg favorite hobby, and he collects vintage fishing gear.